Diwali, the festival of lights, is celebrated by Indian people with great zeal and enthusiasm. It is undoubtedly India’s most important festival that fills our lives with lots of happiness and joy. It is certainly the biggest and brightest festival among all Hindu festivals. Diwali is also termed as Deepavali which is a Sanskrit word meaning “series of lights”. It is also called “Dipotsava” - festival of lights. One of the most important festivals in India, Diwali is celebrated by not only Hindus but also by Sikhs, Jains and some Buddhists. Symbolizing victory of light over darkness, good over evil, knowledge over ignorance and hope over despair; the auspicious Diwali festival is celebrated by Indian people with great fervor. It is observed by family gathering, lighting candles & earthen diyas, worshiping of Lord Ganesh & Goddess Laxmi, festive fireworks & bursting crackers, decorating home with string electric lights & other decorative items, sharing sweets among loved ones and of course exchanging Diwali gifts. People have already started preparation for Diwali festival. Are you? Whether you are looking for Diwali gifts, home decorative items or Diwali idols you need to buy these essentials well in advance. EliteHandicrafts offers you an exclusive range of gifts and decorative items at best prices to choose from. If you have one stop online platform like EliteHandicrafts to buy Diwali gifts, decorative items and other essentials then why you need to go to crowded market. Engage yourself in online shopping for Diwali celebration whether you want to purchase for yourself or want to send Diwali gifts to your loved ones. Explore our exclusive range of Diwali special gifts, sweets hampers, chocolate hampers and other Diwali celebration essentials online; and send a thoughtful Diwali gift as a token of love and care to your loved ones who are miles away from you. Check out our Diwali gifts collection that features Laxmi Ganesh Idols, Goddess Laxmi Idols, Lord Ganesh Idols, Wall Hangings, Toran & Bandarwal, Sweets Hampers, Dry Fruits Gift, Pooja Thali, Religious Statues, Decorative Candles, Colorful Earthen Diyas, and many more Diwali special gifts and decorative items. You can send Deepavali special gifts, sweets and chocolates online to any city of India online. We provide free shipping of gifts delivery in all the major cities and towns of India. People living abroad can also send Diwali gifts to India online to surprise their loved ones. With us you can also send Deepavali gifts to USA, UK, UAE, Dubai, Singapore, London, New York, France, Australia, Malaysia, Europe, Canada, Germany, New Zealand, Philippines and other major locations in abroad from India. We are sure you will get excellent shopping experience after exploring and buying gifts and other items from our portal. You can have the best experience of gift exchange with us as we present you unique Diwali gift ideas so that you can pick the best gift and send it to surprise your loved ones. We provide you an amazing collection of different types of gifts to choose from; at very affordable and genuine rates. Hence you can buy or send Deepavali special gifts online for your loved ones and send online in most hassle-free manner. With us you will save your precious time and hard-earned money as well; as we ensure for punctual delivery of gifts with free shipping. Diwali in fact is a five day long festival. It is a series of festivals - Dhanteras, Choti Diwali (Naraka Chaturdasi), Laxmi Puja Day (Diwali), Padwa & Govardhan Puja, and Bhai Dooj. 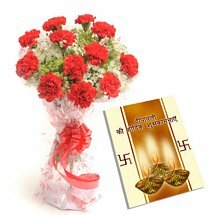 You can also buy Dhanteras gifts, Choti Diwali gifts and Bhai Dooj gifts online with us at very affordable price. Whether you are looking for gifts for Diwali, Choti Diwali, Dhanteras or Bhai Dooj; we make it easy yet convenient delivery of your gifts at your preferred location in any city or town of India and abroad as well. In this category we have arranged an amazing range of Diwali special religious idols, figurines, statues and frames online just for you. You can these items for yourself or gifts for your loved ones. Laxmi Ganesh Idols, Ganpati Idols, Laxmi Idols, Laddu Gopal Statues, Ganesh Frames, Radhe Krishna Silver Fames, and many other religious idols & showpieces are main products in this category you can buy as Diwali and Dhanteras gifts for your loved ones. In this category you will find amazing collection of handpicked gifts from home & kitchen items. Gold plated brass bowls, silver plated brass bowls, silver plated brass cutlery set, silver plated brass tumblers, golden bowls with spoon, silver glasses, golden & silver Pooja thali, ceramic tea cups & saucers set, fancy coffee mugs, and many more. These items can be one of the best gifting idea on this Diwali. In this category we have unique collection of decorative items which you will like to buy in purpose of decorating your home beautifully this Diwali. Our unique collection features colorful earthen diyas, decorative candles, electric lights, floating t-lights, floating diya, artificial flowers, wall hangings, door hangings, toran, bandarwals, latkans, jhoomars, rangoli, religious stickers, and many more to choose from. Gifts hampers are among most popular gifting ideas on Diwali. We have arranged unique Diwali gifts hampers for Diwali celebration so that you can surprise your dear ones sending or presenting the best gift hamper this Diwali. 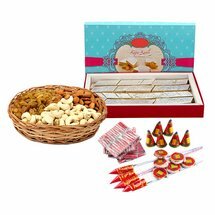 Diwali sweets hampers, flower bunches with sweets & chocolates, greeting cards with sweets & chocolates, Diwali chocolates hampers and Diwali dry fruits hampers are among most popular Diwali hampers. We at EliteHandicrafts offer you a unique collection of authentic Indian sweets and sweets hampers for Deepavali celebration. With us you can send Diwali sweets hampers to India online in most hassle-free manner. Our collection features Kaju Katli Box, Motichur Laddu Box, Mixed Sweets, Soan Papdi, Besan Laddu, Sweets with Diya, Sweets with Diwali Card, Kaju Katli Gift Box with Colorful Earthen Diya, and many more. We have arranged online a unique range of dry fruits hampers for Diwali just for you. Our collection of dry fruits hampers for Diwali are designed with mixed dry fruits, almonds, cashew nuts, raisins, pistachio, etc in potali, basket or box. 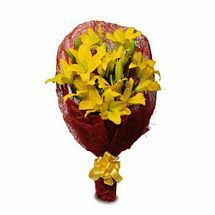 They all are clubbed with other essentials like artificial flowers, decorative items, Diwali diya, candles, colorful earthen diya, chocolate bars, greeting cards, etc. 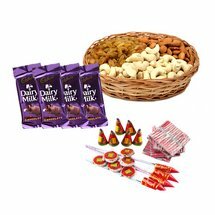 We have designed chocolate hampers for Diwali celebration with fine quality and branded chocolates like Cadbury Celebration Pack, Dairy Milk Chocolate, Dairy Milk Silk, Dairy Milk Fruits & Nut, Kitkat, Ferrero Rocher, Dairy Milk Bubbly, Dark Chocolates, etc. Chocolates are clubbed with Diwali greeting cards, Diwali diyas and other hampers to make a perfect Diwali chocolate hamper for your loved ones. Diwali celebration is incomplete without worshiping of Goddess Laxmi and Lord Ganesh. You will need to have Idols of Maa Laxmi and God Ganpati. You will also need Diwali Pooja Thali and essentials on this day. Hence we present you an amazing collection of beautifully designed Laxmi Ganesh Idols to buy online. Gold and silver plated brass Pooja Thali would be the perfect match with Laxmi Ganesh Idols. You can buy Pooja Thali and Laxmi Ganesh Idols for Diwali Pooja with us. We at EliteHandicrafts also offer a unique and amazing range of Diwali gifts for corporates, employees and office staffs. If you are looking for corporate Diwali gifts, gifts for your employees and staffs then you are here at just right place. Explore our different category to find the best Diwali corporate gifts. Apart from aforementioned Diwali gifting ideas we have many more items which you will like to buy or send on this Diwali with us. Just browse our website to pick the best and perfect one; and buy Diwali gift online at best price for your loved ones. 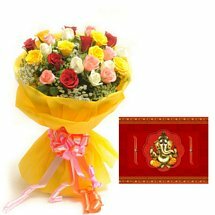 Send Diwali gifts to India or abroad in most hassle-free manner. We ensure for on time delivery of gifts at your preferred location. There are many people who miss to send gifts on right time due to their busy schedules or some other reasons. But they don’t need to worry at all because we at EliteHandicrafts also offer same day delivery and express delivery of Diwali gifts. Taking benefits of our express delivery feature you can send Diwali gifts online to your loved ones in any major cities and towns of India on right day. We can delivery your gift on same day or next day. Be a part of India’s biggest and brightest celebration and send Diwali gifts online to your loved ones selecting from a huge range of handpicked products and gift items at Elitehandicrafts.com. Happy Diwali to All of You! Diwali, the most notable fete of India, exemplifying lights as the manifestation of positivity, cheerfulness, and optimism falls on Thursday, 19 October, 2017. Also termed as “Deepavali”, the festival of lights is celebrated with great zeal and zest across the country in the autumn season. According to Vikram Samvat, the historical and official calendar of India, the main festival night of Diwali with the darkest, new moon night of Kartika month. As per Gregorian calendar, Diwali night falls usually between mid-October and mid-November. Actually Diwali is five day celebration consisting of five festivals namely Dhanteras or Dhana Trayodashi (Day 1), Naraka Chaturdashi or Choti Diwali (Day 2), main Diwali or Laxmi Puja (Day 3), Padwa (Day 4), and Bhai Dooj (Day 5). Each day of five-day Diwali celebration has its own significance and celebrated with different rituals and rites. Dhanteras, also called Dhana Tryodashi, is the first day of five days celebration of Diwali in India. It marks the birthday of Laxmi, the Goddess of Wealth and Prosperity, and the birthday of Dhanvantari, the God of Health and Healing. On the night of Dhanteras, earthen Diyas are ritually kept burning throughout the night in the honor of Goddess Lakshmi and God Dhanvantari. Dhanteras is also major shopping day in India. On this day, people purchase gold or silver articles. If they cannot afford precious gold and silver articles then they at least shop for metal articles such as kitchen pots and other household items. In the evening, Laxmi Pooja is also performed. Naraka Chaturdashi, also called Choti Diwali and Kali Chaudas, is the second day of a five-day-long religious fete of Diwali in India. As per Vikram Samvat Hindu Calendar, it falls on Chaturdashi (14th day) of the Krishna Paksha of Kartika month. According to Hindu literature, Narakasura (a legendary asura or demon) was assassinated on this day by Lord Krishna (an incarnation of Lord Vishnu), Satyabhama (the second most important wife of God Krishna, and avatar of Goddess Laxmi), and Goddess Kali. The day is celebrated with great zeal and enthusiasm by early morning religious rituals, sumptuous breakfast, lavish lunch & dinner, and decoration of houses with earthen Diyas in the evening. Diwali, the Laxmi Pooja, is the third and main festive day. Preparation begins with morning. As the evening approaches, houses are decorated beautifully, Rangoli decorations are made on the entrances, earthen Diyas are ignited, and the Laxmi Puja is performed with religious rituals and rites. Sweets are distributed among near and dear ones. God Ganesha, Goddess Saraswati, and God Kubera are also worshiped on Diwali evening along with Goddess Lakshmi. It is believed that Maa Laxmi, the Goddess of Wealth & Prosperity, roam on the earth on Diwali night. Hence, people make their homes neat & clean, decorate them, and often keep their doors and windows open to welcome Goddess Lakshmi. The day 4 of five-day-long festival of Diwali is associated with two Hindu festivals, Padwa (also called Balipratipada) and Govardhan Puja. The Padwa is associated with married couples, and celebrates the love and mutual devotion between the husband and wife. On this day, husbands and wives exchange thoughtful gifts. Goverdhan Pooja is also celebrated on the day 4 of Diwali. Devotees perform this festival Goverdhan Puja (also called Annakut or Annakoot festival) in honor of Lord Krishna. The day 5 of the five-day-long festival of Diwali is Bhai Dooj, also called Bhau Beej, Bhai Tika and Bhai Phota. Celebrated in much splendor and dedicated to the chaste bond of sisters and brothers, Bhai Dooj (also called Yama Dwitya in Southern India) is celebrated on the second lunar day of Shukla in the Vikram Samvat Hindu calendar month of Kartika. On this day, a sisters makes Tilak on forehead of her brother and prays for him. Sisters get gifts from brothers. The Diwali festival also marks the return of Lord Rama to Ayodhya from exile of 14 years. When Rama, Sita, Laxman and Hanuman were returning from Sri Lanka after defeating and killing demon king Ravana, villagers welcome them with illuminated their paths with ignited diyas. Entire Ayodhya were also decorated with Diyas in the honor of Lord Rama, his wife Sita, his brother Laxman and Lord Hanuman. Prior to Diwali festival people clean, renovate, whitewash and decorate their houses and workplaces. The festival is celebrated in most opulent and splendid way. Diwali gifts are distributed among near and dear ones. Gifts are also send to near and dear ones who are living somewhere else. Online gifting portals have been one of the best mediums to send Diwali gifts. We at Elitehandicrafts has a unique collection of Diwali gifts and hampers to choose from. Whether you are looking for gifts for your family members, or looking corporate Diwali gifts for your employees and clients; we will help you get the best gifts.